Datuk Prof. Emeritus Dr. Alex. E. Delilkan is a name that will live forever in Malaysian cricket and the medical profession. Cricketers remember him as the greatest all-rounder ever exceling in every department of the game he took part in, while in the field of medicine a, professor emeritus of anaesthesiology and critical care, Alex, is a mentor in critical care teaching and medical ethics. At 81, Alex is still lecturing pre-medical graduates at five universities – University Technology Mara (UiTM), International Medical University, Taylor’s College, Mahsa University and University Malaya. This year is his 50th year since he joined Universiti Malaya in 1967. He retired at 55 in 1989 but was rehired the very next day and served them for another 12 years before he decided he wanted to leave them. Alex a national cricketer from 1955 to 1972 and the national captain from 1959 to 1972, first played for his school – St Joseph Institution, Singapore – at the age of 11 and continued until he joined University Malaya in the Republic eight years later in 1954 as a pre-medical student. He quit playing in 1974. He made his debut in 1955 playing for Malaya’s South team against the North at the Selangor Club. Alex whenever he speaks with revelations, frankness, wit and humour. “People do not like me, because I speak the truth and with holds barred,” said Alex whose passion for cricket is unmatched. The fourth in a family of four boys and two girls, he was born into a family with a ‘cricket-mania’ atmosphere. Alex said he and his brothers (Leo Clifford, Joseph Rienzie and Joseph Ignatius) started ‘playing’ cricket at the backyard at home. “On a fair-sized concrete, fat area, we used a marble as the ‘ball’, a piece of wood as the ‘bat’, with slabs of sponge tied to our legs as ‘pads’ and the dustbin as the ‘wicket’,” said Alex laughing. “The ‘ball’ used to travel at lighting speed, and this, perhaps, helped us develop quick reflexes – as we moved fast to avoid injuries. “When it rained, we played indoors (in the bedroom) using table-tennis balls for the ‘ball’. Alex was so opposed with the sport that he would lock himself in his room alone, padded, gloved and capped, with bat in hand, before a mirror practicing all the strokes he had seen before. “I used to assume the identity of various ’state cricketers’ and I have a game between two sides keeping a very persona score-book to record the various brilliant performances and dismal failures,” said Alex who also used to play hockey, football and badminton. 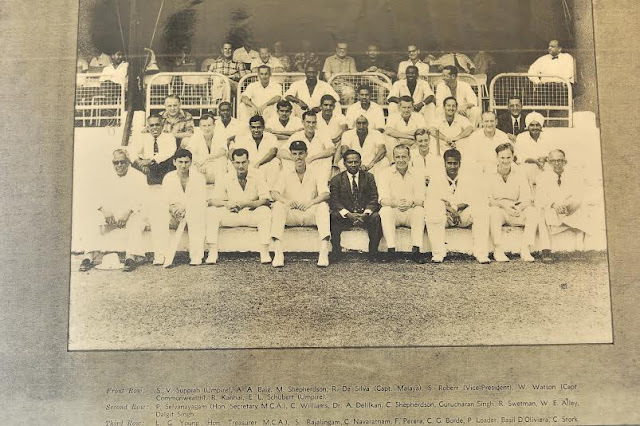 Seymour Nurse, Nawab of Pautaudi and Gary Sobers – 1st ball. Rohan Kanhal, Roy Marshall, Basil D’Oliveira and 8 for 63 against Joe Lister’s English side and his victim included Tom Graveney. Alex was also the first and only Malaysian invited to play for the International Cavaliers in England in 1967. Recalling his famous feat against Sobers on March 28, 1966 at the Selangor Club, he said 10,000 had gathered to watch the game and especially Sobers. “When I bowled out Sobers, there was absolute silence for at least five second before I had claps. This was followed by boos as the crowd had come to see Sobers perform,” recalled Alex. “At lunch break Swanton had told Sobers that the crowd was disappointed that he was out and had to do something to please the crowd. Sobers promised to take three wickets when he was batting. “Sobers took five – Steve Hutton, Mohd Sidek, Mike Shepherdson, John Martin and Gurcharan Singh – after first batter Ranjit Singh. “Then, I was next to bat, but it was West Indies’ Ramadhin who turn was to bowl. The crowd started chanting for Sobers to bowl to take revenge against me for putting him out. The crowd started chanting “ Kill Alex. Kill Alex. Alex married to Penangite, Prabha Senan, whom he met in Singapore at the University where she was doing her degree in education, has four children – three girls(Anne, Sharu, Melanie) and a boy (Rienzie) and had five grandchildren. Alex in sharing his knowledge in both cricket and the medical field has written books. His two cricket books dedicated to Malaysian schools cricket are entitled – Keriket – Malaysian Way and Cricket, a Malaysian Experience. On Malaysian sports, Alex said that everyone has to accept that Malaysian society is polarised. "Until and when we can come to terms that Malaysian society is polarised, we cannot change our standards of sports in the country,” he said. "Back then, we never thought of us being different as we all considered ourselves as one, playing for the love of sports and nation. 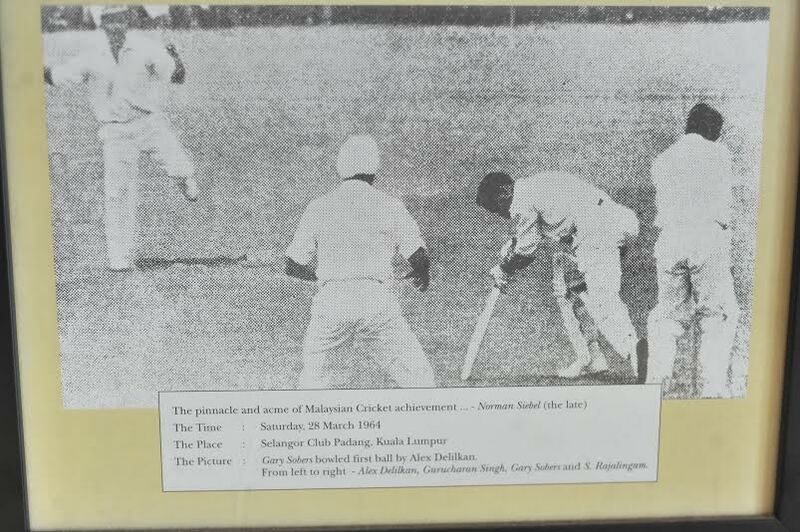 Sports was 1 Malaya then. But today, polarisation starts in the schools!" “And the club system must exists. If we think we can correct the present ills by just focusing on schools sports alone, you are grossly mistaken, Schools athletes can become national athletes overnight. They have to go through a system too. “But even before the schools, parents play a great role. They have to encourage their children to take up the sports culture. “Athletes will also face many obstacles where teachers or lecturers will play a stumbling block to the advancement of their sports career. They have to overcome all these. “Basically sports culture starts from the home to schools, schools to club competition, from club competition to State level and then to national level. “When we start specialising at the pinnacle when things are not right at the grassroots level, we are only heading for disaster." Alex also touched on meritocracy. “Selectors and coaches must be former national athletes and not the president who does not have a clue of the game or which side to hold a racquet. Yes politicians, people who have clout are necessary for the image of the association and financial standings. But they should refrain from being involved in the actually management of the sports. “I also do not believe that we should hire foreign coaches. Out coaches knows best, especially when it comes to people management and local situations. “And I do not like to call them coaches. Coaches are for schools. At the highest level, they should be managers, who manage the athletes, give advice, motivate them and bring the best out of them. If we need foreign assistance, it should be for specific areas which we need to strengthen. The overall running of Malaysian teams should be by local ex-national athletes of the respective sports” said Alex was inducted to the Olympic Council of Malaysia (OCM) Hall of Fame in 2009. Alex views may hit a few nerves, but when the truth is spoken, more often than not it hurts. At least we still have the likes of Alex, so rich in experience, who speaks his mind only because he is passionate of Malaysian sports and wants to see changes. I met Alex in 1987 when I was briefly dating one of his daughters. I remember distinctly that he was a polite and humble man. You would never know he was a high achiever from his simple approach to life. He once said that he would rather stay home and scratch is behind rather than attend fancy dinners. Always remembered that! !